With science and advancement of technology, having a beautiful face and body is within reach. There are so many dermatology clinics offering different techniques for that so called 'I woke up like this' beauty. If my memory serves me right, the word dermatology before equates to surgery. One if going under the knife. But now, treatments are non-invasive meaning no downtime and needle is required. 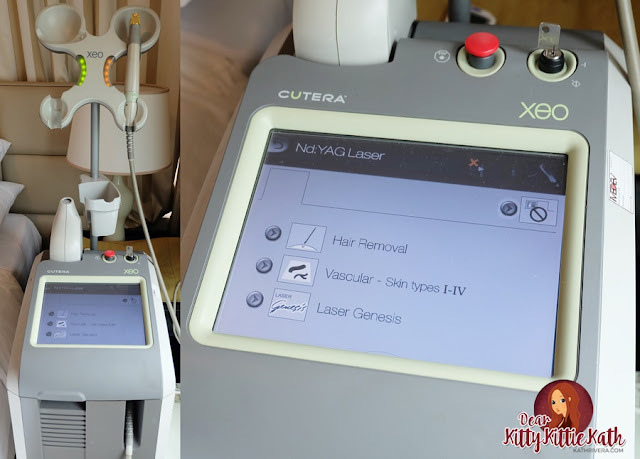 CUTERA Laser is a brand of laser under the Nd:YAG category. Nd:YAG laser has a wave length of 1064 nm and has the capability to reach deeper layers of skin tissue than other types of lasers. Based on the graphic above, it is the kind of laser that penetrates deeper. So it only means, the deeper reach the better treatment result. The event also showcased not just the premium quality of the CUTERA face and body laser treatment but also triggered the company’s call for better awareness of the public when availing of laser treatment services. We were all excited to try CUTERA Laser treatment to the skin disorder/s and issue/s that we want to be treated that day but first we had a discussion on the difference of CUTERA Laser machines from other laser machines offered by various clinics. Our questions regarding each concern were also answered by Dra. Kat. Enlighten that helps erase and lighten benign pigmented lesions such as melasma and sun spots. It is also the Cutera power machine for effective tattoo removal. Cutera truSculpt machine employs the stamp motion in deep tissue healing that delivers effective fat reduction. Titan is the go-to Cutera machine for natural lifting, skin tightening and skin laxity. With skin, body, and facial treatments that have emerged largely in the Metro, it is anxious for us to easily trust clinics and even the process itself. CUTERA remains loyal to define the forefront of medical aesthetics with devices exquisitely engineered to deliver the highest level of performance, safety, and efficacy—providing a wide range of Face and Body medical aesthetic applications, with results that drive patient satisfaction, and inspire trust to medical aesthetic practitioners in the Philippines. 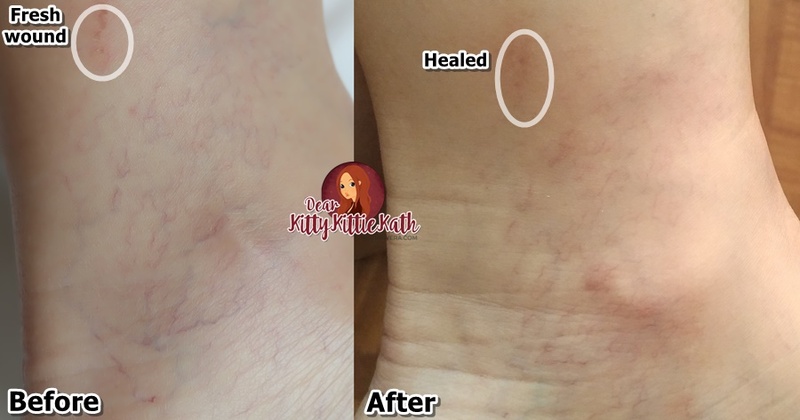 I decided to try the laser vascular using the Cutera XEO machine. I have plenty of spider veins on my left leg, near the medial retromalleor region. The treatment lasted only for 10 minutes. No pain while the laser beam touches the skin. It's a fast ant bite-like feeling on the part being treated. No downtime after the treatment. I can wear socks, shoes, walk, and go to my usual routine after. I just need to refrain from hot baths/tubs and lifting heavy objects for a week. The result for one session can be seen after three to four weeks depending on the severity of the condition. Look, I have a lot of spider veins, see the photo below how the laser vascular procedure is done. There's also a short video below and forgive me if there are blurry parts as the camera can't focus properly :( My apologies for that. The wounds that you'll see below the photo was not treated, okay? I made a mark to show you that both before and after are my legs. Only the part that has spider veins were treated and look at the result. Photo taken after three weeks. I guess on my second and third sessions, my spider veins will be less visible. After 1 session of laser vascular. Be the judge! CUTERA is officially distributed in the Philippines by MEDEV Medical Devices Corp., You can find their machines in the following face and body healthcare industry with top caliber names such as the Dr. Aivee Medical Clinic, Nisce Skin N’ Face Clinic, Belo Medical Group, Makati Medical Center, Asian Hospital, DLSU Medical Center, Skin and Cancer Foundation. These high end clinics ensures you that you get what you paid for. A piece of advice, if you're an avid fan of laser treatments like Laser Hair Removal or other laser services for the face and body be sure to go clinics who are not using refurbished or second hand laser machines. Imagine your skin burned and blistered because these machines are not regularly calibrated as it is supposed to, thus, preventing it from emitting the required laser energy to treat patients. The aftermath, making the condition worse and it will impose emotional pain too. So next time you decide to undergo a laser treatment, don't be fooled by cheap rates. Remeber that there's a saying "It's too good to be true."